Will be available with two engine choices. Hyundai Motor has unveiled the North American-spec Genesis G90 at the 2016 North American International Auto Show in Detroit. The South Korean automaker's flagship sedan will also be sold in China, Russia and Middle East. The 2017 Genesis G90 will be available with rear-wheel drive as standard, but all-wheel drive will be available optionally. 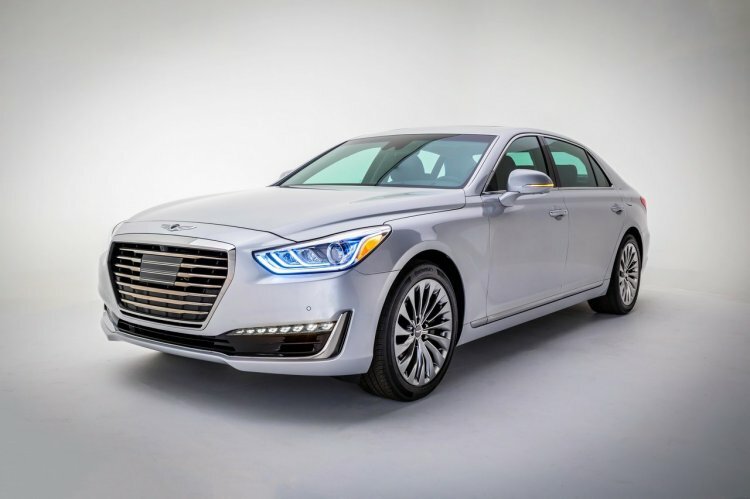 The Genesis G90 will be available with two gasoline engine choices in the U.S. market - 3.3-liter Twin-Turbo V6 and 5.0-liter Direct-injected V8. The 3.3-liter twin-turbo V6 engine produces 365 hp and 376 lb.-ft. of torque, while the bigger 5.0-liter naturally aspirated V8 engine produces 420 hp and 383 lb.-ft. of torque. The 3.8-litre naturally aspirated V6 engine that produces 315 PS (311 hp) and 40.5 kg.m (397 Nm) of torque in the South Korean-spec model won't be offered. An 8-speed automatic transmission will be standard and power will be sent to the rear wheels. H-TRAC all-wheel drive will be available optionally though. Four driving modes will be available - Eco, Smart, Sport, and Individual. The South Korean-spec model (EQ900) is available with a 3.8-liter V6 gasoline engine also. Noteworthy comfort and convenience features include 19-inch turbine-blade design alloy wheels, 22-way power adjustable driver’s seat with power shoulder adjustment, 16-way adjustable passenger seat, 12.3-inch HD display and DIS control knob for the infotainment system, 7-inch TFT-LCD display for the instrument cluster, seven interior ambient lighting colours, Lexicon® Premium Sound System featuring QuantumLogic® Surround sound with 17 speakers and a 10-inch subwoofer, Qi wireless-charging, 9.2-inch HD displays for the rear seats and hands-free opening trunk. The 12.3-inch HD display for the infotainment system can be controlled via a rotary knob. Safety and assistance features include Automatic Emergency Braking (AEB) with Dynamic Bending Light headlights with High Beam Assist, Pedestrian Detection, Smart Blind Spot Detection (SBSD), Lane Keep Assist, Rear Cross-traffic Alert, Driver Attention Alert, and a 360-degree Multi-view Monitor. 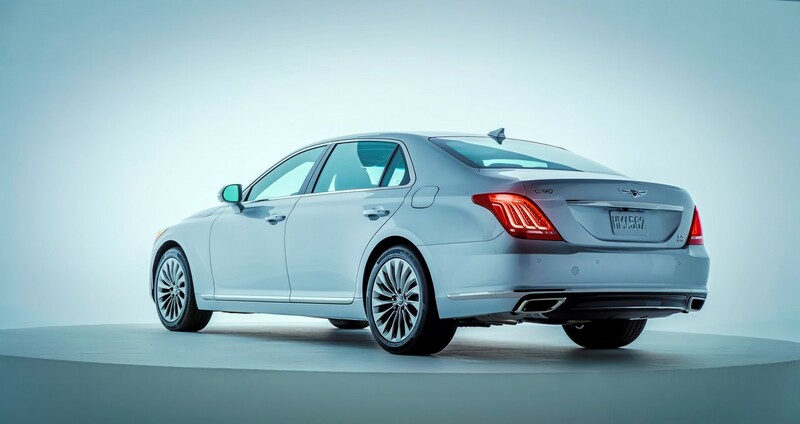 The Genesis G90 will be sold in USA as a 2017 model and its pricing will be announced closer to market launch. Hyundai has not confirmed Genesis for India.